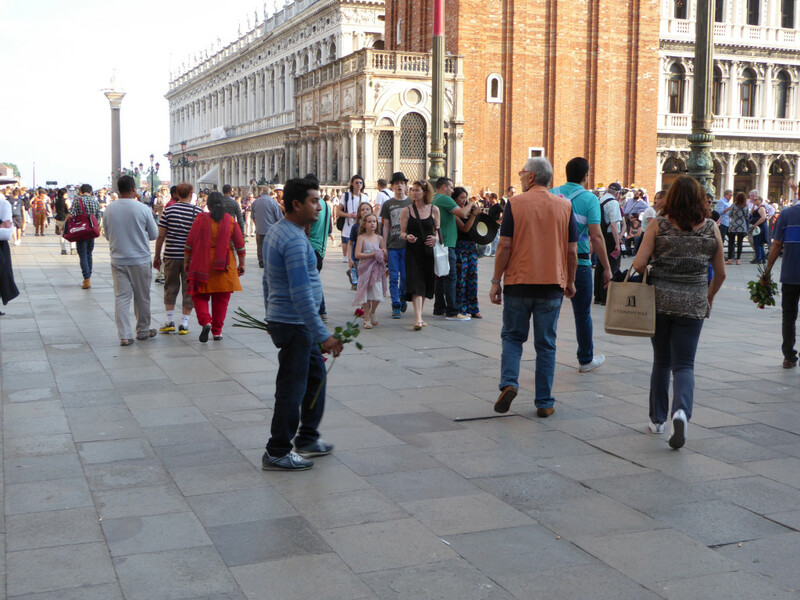 In Piazza San Marco there are the guys who sell roses. I confess to shooing them away. But after an interview by “VeneziaToday” my heart has changed. Often in restaurants, I have seen the owners allow the guys selling roses and I attributed their gentleness to the Italian culture. 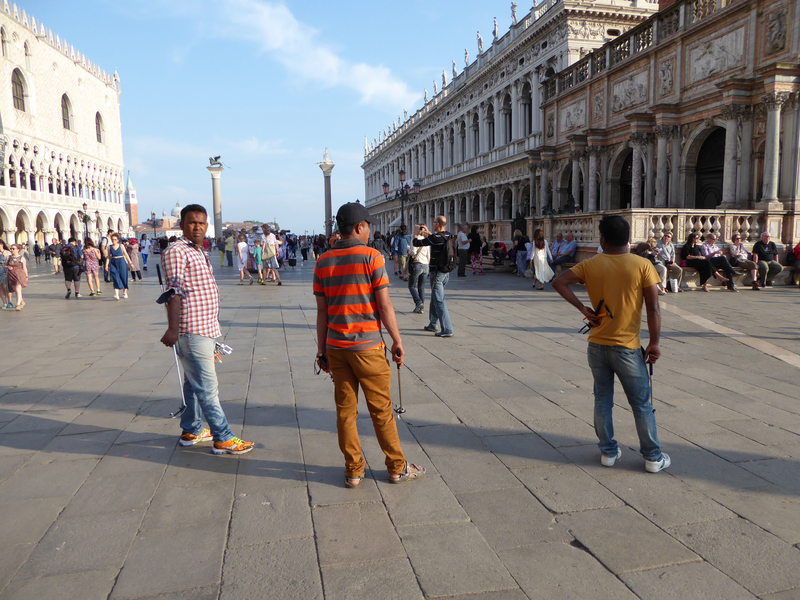 They interviewed Hajib, a 20 year old from Bangladesh who has been selling roses in San Marco for 3 years now. Yes, he is in the country illegally. But every morning he gets up and buys a mazzo (bunch) of roses for 10 to 15 Euro in Mestre (the town over the bridge from Venice) where he lives with other vendors. Now if he is 20, then he came to Venice at 17 years old. He says he works for no one, he buys outright the roses. (There are shady businessmen in Mestre and indeed Venice who provide some of the goods you see for sale on the streets like the fake purses. I have seen the storage rooms where they keep the goods late at night when they are closing.) He says he can sell about a dozen roses at 3 Euro, so he makes more or less 36 Euro and must invest the 10-15 Euro again the following morning, making his gain of about 15 Euro per day. He stays in the square from early morning until about 10 pm daily. There are no “hours” and he risks getting arrested daily and having the flowers he purchased confiscated. They pool their earnings to rent small spaces to live together. This is no luxury life. Some of these vendors have walked from Bangladesh to Venice. 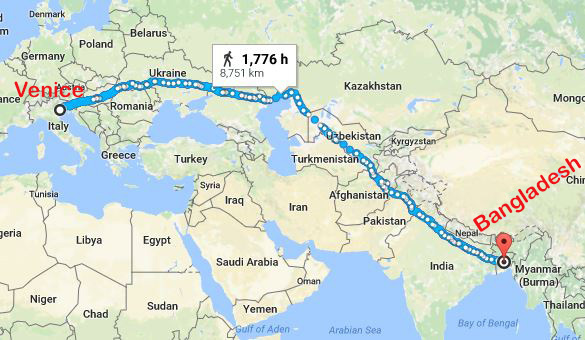 That is almost 9,000 km, about 5,500 miles and through countries and terrain sometimes quite dangerous. They have been see walking along the Autostrada A4 from Trieste near the border of Solvenia. He says “I do this, I am young, I smile and I do not hurt anyone!” So the restaurant owners are smarter and kinder than me! So buy the Roses. Keep them, or give them to someone. The roses add beauty to the day, are bio-degradable, so Why Not? You won’t be hurting anyone and this young man will eat. …..But I am still not going to let those guys who sell the lighted toys they throw up in San Marco off the hook. They mess up my pictures. Maybe I’ll just buy them all and send them home early! If I were there I so would buy the roses too! Judgement free💕 This was truly an enlightening and unique blog post, thank you for your honesty as well.